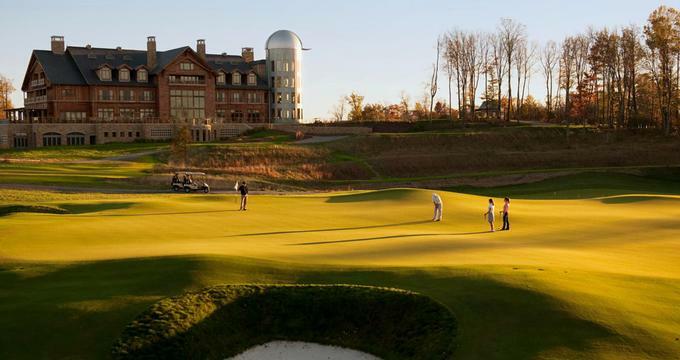 Set on 12,000 acres of protected land surrounded by the magnificent Blue Ridge Mountains in Virginia, Primland is a luxurious, eco-conscious resort that offers the ultimate retreat for world-class golf, award-winning dining, and outdoor activities. Situated just 13 miles from the scenic Blue Ridge Parkway, Primland provides a variety of luxurious accommodations, ranging from guest suites and private cottages to mountain homes and tree houses, all fitted with rustic decor and modern amenities. Founded by Didier Primat, Primland was developed to offer guests an environment of luxury and refinement surrounded by a place of immense beauty from the perfectly appointed accommodations and fine dining restaurants to the exclusive spa and fitness center and world-class golf course. 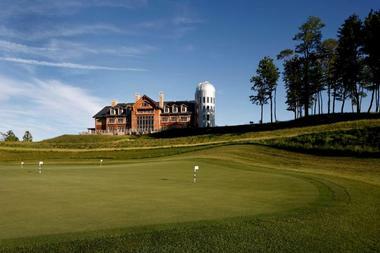 The resort is an ideal weekend getaway from Washington, DC. 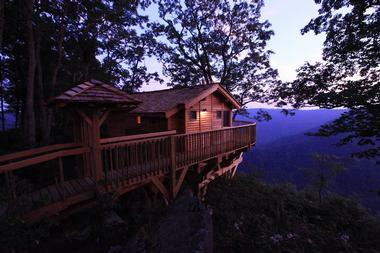 Accommodations at Primland range from guest suites in the main lodge to individual cottages, mountain homes, and treehouses. All abodes feature elegant decor with rustic flair along with modern amenities and conveniences, including 400-thread count Frette bedding and plush bath towels, deluxe bath products, flat screen televisions, DVD players, coffee makers and mini fridges. Private cottages and mountain homes have fully equipped kitchens, spacious living areas with gas fireplaces and balconies or glass-walled aeries boasting spectacular views of the surrounding landscapes. Treehouse is set high above the forest floor and overlooks the Dan River, and there is complimentary wireless Internet through the property. Situated at the end of the property, The Lodge at Primland is sophisticated in style and spectacular in scale, offering guests a refined lodging experience. The large cedar and stone Lodge features 26 guestrooms and suites, each individually designed and decorated for a unique and comfortable retreat. Guestrooms and suites feature king-sized beds in 400-thread count Frette bedding, en-suite bathrooms with separate showers and baths, plush towels and deluxe bath products and living spaces feature modern amenities, including flat-screen televisions, DVD players, coffee makers and mini fridges. Private balconies and large windows embrace stunning views of the surrounding forest. The Lodge at Primland features nine well-appointed Mountain Rooms, which range in size from 518-800 square feet, and offer a choice of two queen-size or one king-size bed fitted with luxurious, custom-designed 400-thread count Frette sheets and plush down duvets. En-suite bathrooms feature imported mosaic tiles and stylish Dornbracht fittings, as well as thick towels, robes and slippers, and BVLGARI bath products. Spacious living areas have modern amenities, including mini fridges, wet bars, coffee makers, flat screen televisions, DVD players and a fully automated Lutron s lighting system. Private balconies boast beautiful views, and complimentary wireless Internet access can be found throughout. The Lodge also has 16 Blue Ridge suites, which range in size from 900 to 1,125 square feet and offer a selection of two queen-size or one king-size bedfitted with luxurious, custom-designed 400-thread count Frette sheets and plush down duvets. En-suite bathrooms feature imported mosaic tiles and stylish Dornbracht fittings, as well as thick towels, robes and slippers, and BVLGARI bath products. All Blue Ridge Suites feature a private master bathroom and additional powder room in the living areas, as well as separate living and dining areas, some of which have sliding panels that can be used to reconfigure the room's private spaces. Spacious living areas have modern amenities, including mini fridges, wet bars, coffee makers, flat screen televisions, DVD players and a fully automated Lutron s lighting system. Private balconies in some suites boast beautiful views, and complimentary wireless Internet access can be found throughout. Located in the Observatory Tower, directly below Primland's Observatory, the two-story Pinnacles Suite is 1,800 square feet in size and offers the ultimate in gracious lodging. The Suite has a unique glass-walled aerie that offers extra levels of privacy and luxury, along with spectacular panoramic vistas of the stars and landscapes. The upper level of the suite is home to the master bedroom, which offers a king-size bed fitted with luxurious, custom-designed 400-thread count Frette sheets and plush down duvets. En-suite bathrooms feature imported mosaic tiles and stylish Dornbracht fittings, as well as thick towels, robes and slippers, and BVLGARI bath products. Two bathrooms feature imported mosaic tiles and stylish Dornbracht fittings. A custom-designed spiral staircase connects the upper and lower levels, where a gracious living area can be found with modern amenities, such as mini fridges, wet bar, coffee maker, flat screen television, DVD player and fully automated Lutron s lighting system. Complimentary wireless Internet access can be found throughout. Fairway Cottages offer guests elegant and comfortable accommodation options along the 10th and 18th fairways of the renowned Highland Course. The refined duplex cottages named the Cardinal, Sparrow, and Woodpecker are spacious and bright and feature hardwood floors, high cathedral ceilings, ornate stone fireplaces and private decks with alluring views over the golf course. Cottages have separate bedrooms with king or queen-size beds in custom-designed 400-thread count Frette sheets and plush down duvets, en-suite bathrooms with showers and bathtubs, plush robes and slippers, and luxurious L'Occitaneen Provence bath products. A large studio within the cottage has a sleeping area, bathroom, kitchenette with mini fridge, wet bar and microwave and a dining area while modern amenities include two flat-screen televisions, gas log fireplaces, coffeemakers, and telephones. Complimentary high-speed wireless Internet is available throughout the cottages, and additional extra include a private putting green, designated curbside parking and twice daily housekeeping. Resting high above the Pinnacles of Dan and the Dan River Gorge, four new Pinnacle Cottages, namely Bluebird, Robin, Hummingbird, and Oriole offer comfortable, expansive lodging on the edge of the Blue Ridge Mountains. Named after the songbirds who give the region sound, these beautifully appointed two-story chalet-like cottages each feature two spacious Dan River Suites and two Cedar Bluff Rooms, with full private balconies and breathtaking views. Two-story Pinnacle Cottages have spacious living rooms on each floor, conveniently placed in between the Dan Suites and Cedar Bluff rooms, which can be used a communal space if the cottage has been booked by different parties. Eight Dan River Suites boast over 900 square feet of living space, as well as large covered decks with sweeping views of the valley below. These suites offer two queen-size or one king-size bed fitted with custom-designed 400-thread count Frette sheets and down duvets. En-suite bathrooms have separate showers and bathtubs, luxurious Frette robes and slippers, and BVLGARI bath products while naturally lit living spaces enjoy modern amenities, including flat-screen televisions, gas log fireplaces, coffee makers, wet bars, and fully automated Lutron shades. Covered decks and balconies embrace spectacular views of the valley below, and complimentary wireless Internet access can be found throughout. The Pinnacle Cottage's eight Cedar Bluff rooms are 552 square feetin size and feature king-size beds with plush 400-thread count Frette sheets and down duvets, and en-suite bathrooms with separate showers and bathtubs, luxurious Frette robes and slippers, and BVLGARI bath products. Spacious living areas have modern amenities, including mini fridges, wet bars, coffee makers, flat screen televisions, DVD players and fully automated Lutron lighting system. Private balconies boast beautiful views, and complimentary wireless Internet access is available for guests' use. Perched along ridges and tucked into hillsides, Primland's 11 Mountain Homes are unique in every way, offering guests a taste of mountain living at its very best. Mountain Homes feature spacious bedrooms with king or queen-sized beds dressed in custom-designed 400-thread count Frette sheets and down duvets. En-suite bathrooms have separate showers and bathtubs, luxurious Frette robes and slippers, and BVLGARI bath products, and there are extra guest bathrooms located in some of the homes. Spacious living and dining areas are ideal for entertaining with dining tables and chairs, flat-screen televisions, gas log fireplaces, coffee makers and complimentary high-speed Internet access while fully equipped kitchens have all the utensils and appliances necessary for comfortable holiday living. Tucked into the mountainside, each home boasts breathtaking views of the surrounding Blue Ridge Mountains. Outdoor decks with comfortable furniture and gas grills are the perfect way to relax and soak up the magnificent views. Perched on the edge of the mountains just a short way from the Lodge, Primland's three exclusive Tree Houses, namely Barn Owl, Cooper's Hawk, and Golden Eagle,promise an unforgettable experience. Built around the stable branches of the tree tops, these intimate log cabins have full decks that offer bird's eye views of Primland's natural setting sweeping, the majestic Kibler Valley and North Carolina Piedmont. Treehouses feature king-size beds dressed in custom-designed 400-thread count Frette sheets and down duvets, hand-stitched quilts and pillow shams from Vivanais, and en-suite bathrooms with soaking bathtubs, luxurious Abyss & Habide cor robes and slippers, and BVLGARI bath products. Living rooms have modern amenities, including flat-screen televisions, telephones, Keurig coffee makers, in-room refreshment centers, and complimentary high-speed internet and cabins are cleaned twice daily. The Lodge has a four-wheel drive vehicle for accessibility to and from the Lodge. Primland has a range of dining options from fine dining to casual pub fare, using locally sourced organic produce from regional farms and purveyors and traditional flavors. 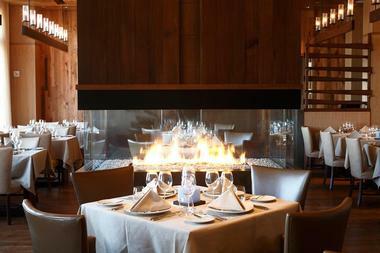 Located on the main floor of the Lodge, Elements Restaurant is a refined dining room that celebrates the elements of air, earth, fire and water through an inspired menu of creative cuisine with a focus on organic and sustainable ingredients. Executive Chef Ryan de Rieux produces elegant, inspired dishes that showcase the natural abundance of the Virginia Highlands and are beautifully presented to take farm-to-table dining to new heights. The innovative cuisine is accompanied by an expansive, hand-selected wine collection, which features fine wines from around the world. The exclusive Chef's Table at Element's allows guests to enjoy a memorable nine-course tasting menu with an array of fine wines. The 19th Pub is a welcoming, lively bar that is home to a well-stocked bar that offers an extensive range of handcrafted cocktails, draft beers, single malts and international wines, as well as a menu of hearty fare that includes appetizers, freshly made salads, sandwiches and seasonal entrées. Built atop the old stables with a rustic, secluded setting, Stables Saloon is open seasonally for breakfast or dinner, as well as private parties and social events. The Stables Saloon menu features classic, Southern-inspired cuisine, and hosts Chuck Wagon Buffets and Casual Southern Style Dinners during the summer season, which are accompanied by traditional recreational games such as horseshoes, corn hole games, and croquet. The Spa at Primland offers a tranquil environment for renewal and rejuvenation with a variety of spa services and treatments created to restore balance to body, soul and spirit. Combining the ancient art of American Indian healing with the finest European spa rituals, guests can enjoy a range of outstanding spa treatments, revitalizing massages, pampering facials, indulgent day rituals and other services such as yoga and meditation, in a soothing and serene environment. 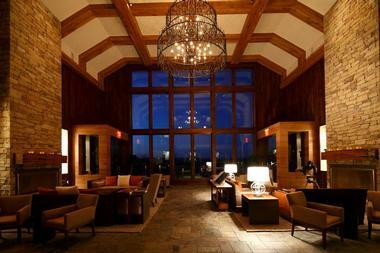 Primland offers a wealth of amenities and facilities to ensure absolute comfort and style for every guest. The resort is home to an exclusive spa and wellness center, a 24-hour fitness center, a private theater and observatory dome, a comprehensive DVD and book library, a soaring Great Hall with twin fireplaces, and a double-story wine room stocked with fine wines from around the world. A games room features a ping pong and billiards table, as well as Wii and Xbox 360 gaming consoles, and a 17-seater boardroom with video teleconferencing capabilities, a fully equipped kitchen, and secluded terrace is ideal for business functions and private events. Activities in and around the resort include world-class golf, horseback riding, swimming, fishing and mountain biking, as well as nature walks, paddle boarding, geocaching and sporting clays. Primland is home to a range of casual and elegant function venues for a variety of special occasions, business meetings, and corporate retreats. In addition to providing the perfect venue, Primland also offers luxurious accommodations, excellent dining, a wealth of outdoor activities and friendly, welcoming hospitality.